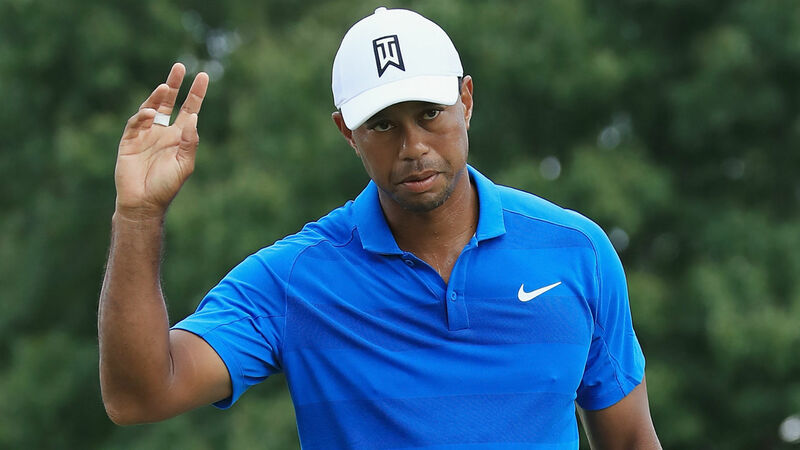 A resurgent Tiger Woods has toyed with ending his five-year PGA Tour winless drought a handful of times this season, to no avail. But the 14-time major champion enters the weekend at the Tour Championship with a share of the 36-hole lead Saturday, once again stirring hope for a win in his final individual shot for 2018. Woods, who followed a pristine first-round 65 with a clunky 68 on Friday, began the third round tied with Justin Rose at 7 under for the tournament at East Lake Golf Club. It looked, for a time, that Woods might cruise into Round 3 with a two-stroke cushion and sole possession of the lead until he made a mess of the 16th hole Friday, on his way to a double bogey-6. Woods saved face and birdied No. 18, avoiding the familiar mid-round plunge down the leaderboard that has plagued his tournaments this year. Nonetheless, it’s Woods’ first 36-hole lead on the PGA Tour since the 2015 Wyndham Championship. He tees off with Rose in the final group at 2:30 p.m. ET. Sporting News is tracking Tiger’s score and providing live hole-by-hole updates below. Woods gets into some trouble on No. 16. After his tee shot found the rough, the approach rolled and rolled, far and to the right of the green. Then his chip fell short and rolled back downhill. Woods finally closed on the hole, but couldn’t save par. Meanwhile, Justin Rose birdied and gained two strokes. Woods’ lead is trimmed to three shots. A rough lie leads to bogey. After turning in a bogey on No. 9, Woods has been steady as can be through the back nine with a birdie and five pars. Rory McIlroy and Justin Rose are tied for second at 8 under. Woods made a four-foot putt to save par but gains a stroke on Rose, who cards his second bogey of the day. The difference is now five shots. Woods hit the fairway off the tee but falls short of the green on his approach. Instead of chipping up, he pulled out the putter and wound up just shy of the hole. He’ll settle for par. Another tidy birdie for Woods as he taps in from six feet out. Rose birdied No. 12, too, but once again can’t gain any ground. Par holds again on the 11th. It could be a big one, as partner Justin Rose had a birdie opportunity but missed from about 10 feet out. Instead, Woods takes care of business and avoids a potential two-stroke flip. On the green in two, Woods badly missed a birdie chance long by about three feet. But he cleaned it up for par and maintains a four-stroke lead over partner Justin Rose. Woods’ tee shot missed the green to the left, and he needed to sink a nine-foot putt to save par. It barely slid by the hole and he settles for bogey, taking a 5-under 30 into the turn. He still leads second-place Justin Rose by four strokes. Woods missed the fairway again, his tee shot finding the rough slightly, but recovers again with more stellar iron play. He pushed a long putt for birdie and taps in for par. So ends the birdie streak, but Woods is about to card one of his best nine-hole performances in some time. Woods has rattled off FIVE consecutive birdies. This time, he recovered from his first missed fairway of the day, dropping an approach from the bunker within 5 feet of the hole. His putting has been on the money. Woods is 6 under through seven holes and has built a five-stroke lead.
? This is not a drill. ? @TigerWoods is -6 thru 7. Six holes. Five birdies. Woods found the greenside bunker on his second shot but stuck his third within 10 feet of the hole. As has been typical today, he didn’t flinch on the putt and holds a four-stroke lead. Make that three consecutive birdies for Woods. He’s 4 under for the day and cruising with a four-stroke lead. Woods has hit nine of his last 10 fairways going back to Round 2. 3-3-3-3-3 start for @TigerWoods . What a start. Woods, after staying a perfect 3 for 3 on fairways, was facing down a 21-foot putt but sinks it for yet another birdie, padding his lead to three strokes over Rory McIlroy. So far, Woods appears to have found his form from Thursday, when he carded a 65. -3 thru 4 holes. ??? @TigerWoods is on fire. Another pristine iron shot drops inside 10 feet to the pin. Woods makes the putt and ups his lead to 9 under with a pair of birdies through his first three holes. Another birdie for @TigerWoods . Woods’ tee shot lands 15 yards from the hole, setting up another mid-range birdie putt. This time, he falls just short and settles for par. Elsewhere, Rory McIlroy (7 under) has taken over second place from Rose with a pair of birdies through three holes. Woods starts hot with a 292-yard drive in the middle of the fairway, then buries a 20-foot birdie putt. Rose, meanwhile, cards a bogey, and Tiger retakes sole possession of first with a two-stroke swing out of the gate.